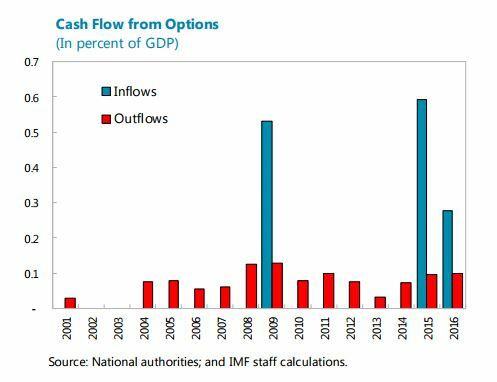 An IMF paper notes: “Since at least 2001, Mexico’s federal government has hedged the near-term fiscal impact of declines in oil prices through put options. Using a structural model calibrated to the Mexican economy, we quantify the overall benefits of this long-standing policy. Compared to a self-insurance alternative, we find welfare gains from hedging through put options equivalent to a permanent increase in consumption of 0.4 percent. These gains arise mostly from a reduction in sovereign spreads and to a lesser extent from smoothing income volatility. In terms of design, expanding the program to cover domestic fuel sales could yield further gains once gasoline and diesel markets are liberalized. Relying more on liquid instruments—such as options on the Brent—is an avenue worth exploring to ensure the program remains cost effective.”. Read the paper.